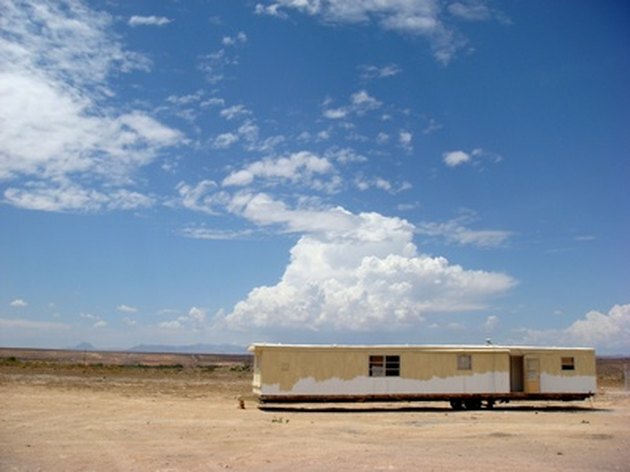 Many mobile homes are located in rural areas where there are no municipal sewer systems. Mobile residences must use an individual sewer system otherwise known as a septic system. These systems use a septic tank and drain lines to process and remove the waste materials from the home. Used on mobile homes as well as permanent structures, the plumbing process remains primarily the same for both. Locate the septic tank a minimum of 10 feet from the outer wall of the mobile home. The tank should be buried at a depth of 2 to 4 feet, the shallower the better to accommodate your drain lines. Four-inch PVC pipe will lead from the septic tank to the distribution box, which will be located at the head of the drain lines. Additional PVC pipe will travel from the distribution box to the drain fields where the water will be absorbed back into the soil. Dig a ditch from the inlet side of the septic tank to approximately 3 to 4 feet under the mobile home. This ditch needs to be wide enough to accommodate a 4-inch PVC pipe and should have a slight incline with the lower end culminating at the inlet port of the septic tank. You want this slope to allow gravity to remove the waste and waste water from your home, but you do not want it too steep. If too steep the water will actually outrun the other waste materials leaving them in the drain line instead of carrying them to the septic tank. This can eventually lead to a clogged drain line as the materials continue to build up. Locate the main drain line coming from the mobile home. All of the toilets and other drains should converge into a single drain line under the home. Connect the PVC pipe coming from the septic tank to this main drain line. Attempt to limit the number of turns and couplings in this section of the drain line. Also be certain to keep the couplings smooth and clean on the inside of the drain. A rough or ragged coupling can cause items to hang up, leading to clogs and system failure. Also make certain the drain lines is always traveling downhill. Test the drain lines to be certain all couplings and fitings are water tight and hold up under usage. Once the test confirms the system is in good working order, back-fill the ditches and cover over all elements of the septic system.